(587) 988-0312 Have a Question? Welcome Home to this tastefully updated three bedroom, two full bathroom townhouse in Norshire Gardens! Enjoy an active lifestyle, as you're walking distance to countless shops, major bus routes and schools. Conveniently located on the back perimeter of this Development, enjoy easy access to the street level or assigned parking. The home has some stand-out touches; including the chic and durable vinyl plank flooring throughout. The vinyl windows on the main and upper level, help to bathe the home in lots of natural light. 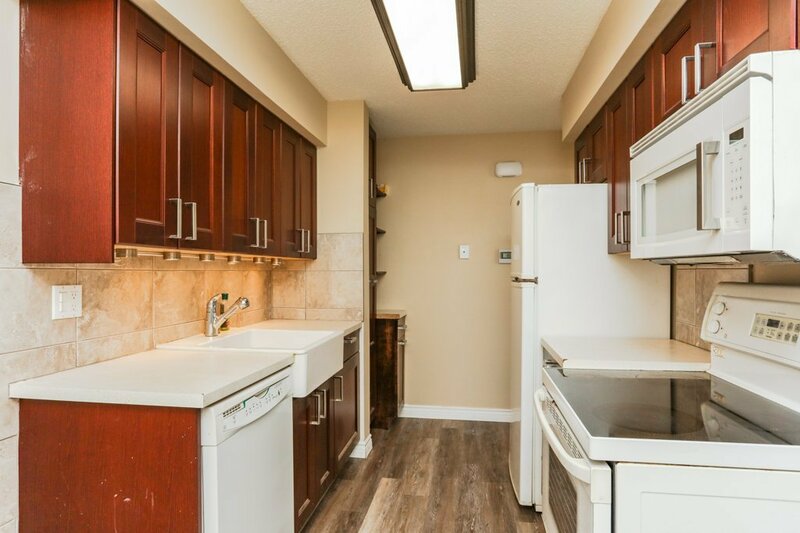 The kitchen features modern tile, newer cupboards and an oversized sink. Upstairs, are three ample sized bedrooms and a master suite with a walk-in closet and built in storage. The shared four piece bath features a deep jetted tub with upgraded tile and vanity. The basement has been tastefully developed with two living spaces. There is a utility/laundry room tucked beneath the stairs, and a second four piece bathroom complete with built in space for clothing, seasonal wear, or storage. PLEASE READ! Norshire.Livrealestate.Ca REQUIRES CONSIDERATION FOR AND AS A CONDITION OF ALLOWING YOU ACCESS. ALL PERSONS UNDER THE AGE OF 18 ARE DENIED ACCESS TO Norshire.Livrealestate.Ca. IF YOU ARE UNDER 18 YEARS OF AGE, IT IS UNLAWFUL FOR YOU TO VISIT, READ, OR INTERACT WITH Norshire.Livrealestate.Ca OR ITS CONTENTS IN ANY MANNER. Norshire.Livrealestate.Ca SPECIFICALLY DENIES ACCESS TO ANY INDIVIDUAL THAT IS COVERED BY THE CHILD ONLINE PRIVACY ACT (COPA) OF 1998. Norshire.Livrealestate.Ca contains links to other web sites. Please note that when you click on one of these links, you are moving to another web site. We encourage you to read the privacy statements of these linked sites as their privacy policies may differ from ours. Do you have a good faith belief that your intellectual property rights have been violated by Liv Real Estate? Do you have a good faith belief that a third party may have uploaded content to Norshire.Livrealestate.Ca? 1. Please describe the copyrighted material, work or other intellectual property (collectively "Material") which you believe is being infringed upon, and where on the Norshire.Livrealestate.Ca website the Material is located.